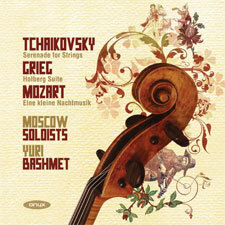 "An extraordinary level of refinement is achieved here as Yuri Bashmet and his Moscow Soloists completely strip away the "pop classics" perception of these three enduring pieces, persuading us to view them in a different light.....This is gorgeous"
A favourite programme from an outstandingly successful group who have now released 4 ONYX recordings, 2 of which received Grammy honours. This is a programme of unashamed warhorses, the Holberg Suite, Serenade for Strings and Eine kleine Nachtmusik by the three above composers, given fresh and idiomatic readings by the great Moscow players for whom these are party pieces. Sublime!